In 3-quart saucepan, cook ground beef over medium-high heat 5 to 7 minutes, stirring occasionally, until no longer pink; drain. 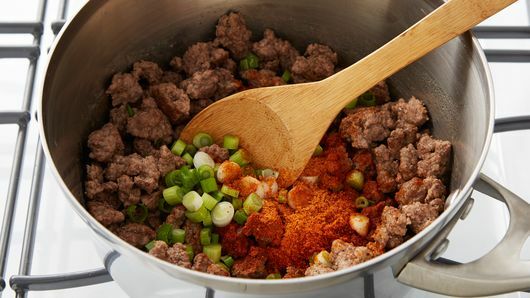 Add onions and taco seasoning mix; cook 1 minute. 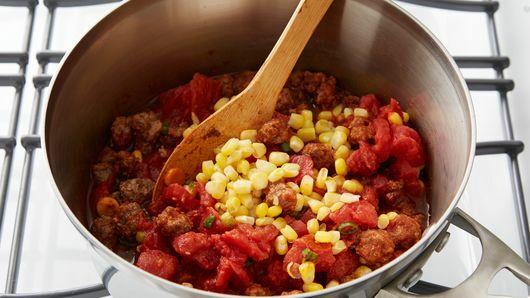 Stir in tomatoes, corn and water. Heat to boiling. Reduce heat; simmer 10 minutes. To serve, ladle soup into serving bowls; top with cheese. Tip: Saving a batch for later? Fill freezer bags with soup, then lay flat to freeze for easy stacking and freezer organization. More smart freezer bag tips. 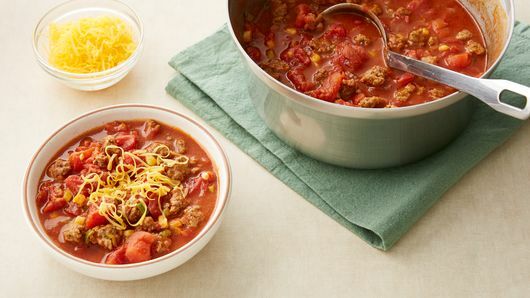 Soup is a staple dinner not only because it warms you from head to toe on a cold day, but also because it makes for a great leftover meal that you can store in your freezer to keep on hand for busy nights. 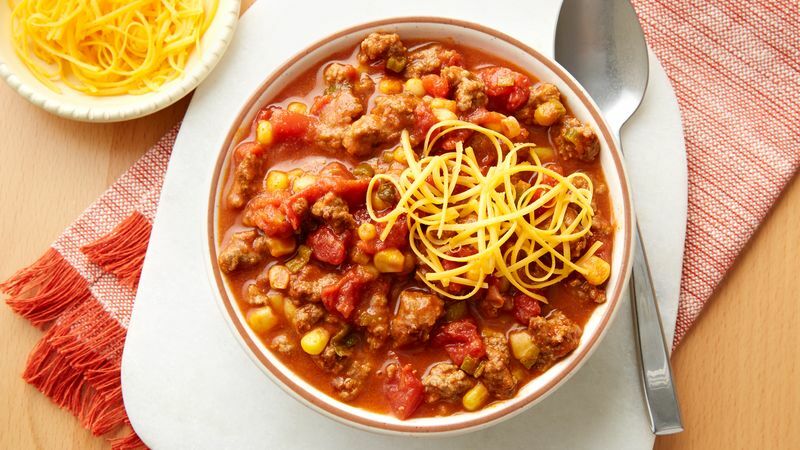 This taco soup and other soups made with beef and veggies are an especially good choice for making ahead of time. Seal this taco soup in freezer bags and lay them flat in your freezer so they’re easy to stack and don’t take a lot of space when frozen. When you’re ready to eat some tasty taco soup for dinner, let the soup defrost in the bags overnight in the refrigerator. Then, simply place into a microwave-safe bowl and heat for 4 to 6 minutes, or until heated through. Top your soup with extra shredded cheese and any one of your favorite taco toppings like sour cream or avocado. And soup season isn’t limited to just the winter. Enjoy soup all year round but never get bored! These easy ways to take your soup up a notch are here to help.